Ripple has strong Historical ties with Sorrento, originally built for Tally Erlandsen, the then long standing lessee of the Sorrento Baths and original owner of the Fish and chips shop in that location. 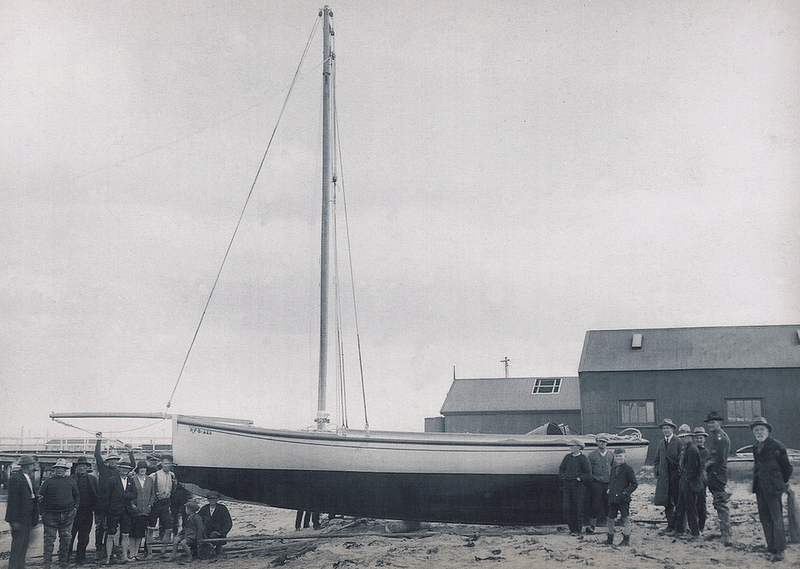 The boat was Built at Queenscliff by Peter Locke, his first boat. The owners who commissioned the restoration found her in disrepair in at Port Albert in 1987 after having spent some seven years on the bottom. Ripple was relaunched on Saturday 4th November 1989 By the daughter of Tally Erlandsen. Tally Erlandsen we believe was the first commodore of the Sorrento Sailing Club. Photos of the original launching in 1926 and the relaunching in 1989 have also been preserved. Sold to Patrick and Susan O’Hara in Perth before returning to Sorrento and now owned by Peter Hannah. Ship’s log: Sunday, February 14th…by noon the island at entrance of harbour bore north half a mile distant. At this time we had a view of this part of the spacious harbour, its entrance is wide enough to work any vessel in, but, in 10 fathoms. Bar stretches itself a good way across, and, with a strong tide out and wind in, the ripple is such as to cause a stranger to suspect rock or shoals ahead. The Ripple is the first couta boat built by Peter Locke in his own right. He started working with Mitch Lacco in Queenscliff in 1924 and took over the business in 1926. 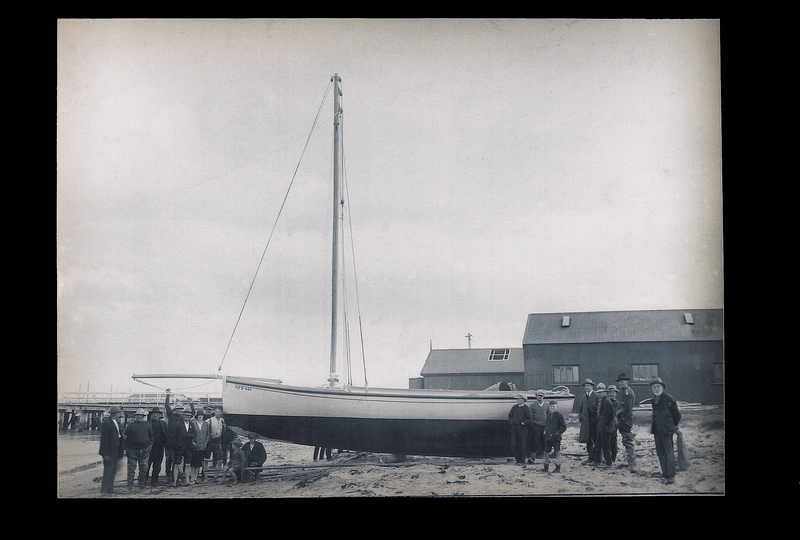 The Ripple was the first of a great many fishing boats built through a remarkable career that produced a wide range of boats from dinghies to shark fishing boats of 70ft. Her lines show characteristic Locke modifications to the earlier Lacco lines: a little fuller along the garboard to assist ballasting and under the engine bed, and hence through to the stern. She is shallower of draft than many, but this probably results from a specific request from the owner who wanted to negotiate the shallow waters off Sorrento rather than to ply the Rip. Lacco and Locke worked from a shed at the rear of 31 Beach Street, Queenscliff. In those days, before the making of the Cut, or Creek in 1934-6 the newly constructed boats could be launched directly into the waters of Port Phillip from the rear of the shed. Today the water’s edge is some hundreds of metres further to the East. Fortunately photographs remain of the launching of the Ripple showing the shed, the old jetty off Wharf Street, and the sense of occasion that accompanies any new launching. The Ripple spent her early years working from Sorrento. Her owner was Erland (Tally) Erlandsen whose father had jumped ship and settled in Sorrento in 1890, living in what is now the Sportsgirl store in the main street and working as a boat repairer and fisherman. On returning from the First World War Tally went fishing with his brothers before commissioning the Ripple for himself. In those days the catch was unloaded to the Sorrento pier to a trolley and rail system that carried the boxes to the foreshore for pick up by truck to go to the markets. Tally became something of a Sorrento identity – president of the Fishermen’s Co-op, Master of the Lodge, member of the Citizens Association, Returned Services League, Foreshore committee and for a long period resident in Erlandsen Ave and ranger of the adjacent foreshore and camping ground. Following the outbreak of the Second World War he took over operation of the Sorrento Sea Baths and Kiosk, offering boat hire and fish sales in addition to bathing and refreshments. In 1945, with Ted Mackinnon (owner of the Mermerous) he built a jetty at “the Docks”, opposite Erlandsen Ave, and here he wintered the Sorrento fishing fleet. The remains of the winch used to haul boats from the water can still be seen at the head of the hardstand. In 1948 he instigated the founding of the Sorrento Sailing Club, was appointed first Commodore and conducted the first race from the Docks. His Honourary Life Membership, and the continuing use of the name “Tally” amongst the fleet of rescue boats recognize his contribution to the Club. Tally ceased full time fishing when he took over The Baths and the Ripple lay idle for some time before being purchased by Dave Newman of Rye. He refurbished her and fished from Rye until moving to San Remo in 1944. At one time she was swept away in a storm, but was recovered and repaired. She passed to the O’Halloran family in the 1950’s and was used for recreational fishing along the Gippsland coast. By this time she was purely motor driven and a cabin had been added for comfort and practicality. The O’Halloran children can vividly recall retreating to the cabin top as their grandfather struggled to subdue a rather large shark in the cockpit – succeeding only after its thrashing had splintered the engine box. Ripple was rediscovered at Port Albert in 1988 by club member Robert Finkestein. Following a substantial refurbishment at the Wooden Boatshop, Tally’s daughter, Mrs. Ida Clarke, presided over her re-launching at Sorrento. 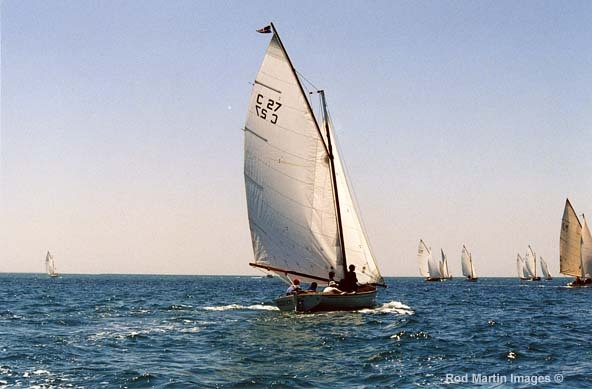 In 1998 Ripple was purchase by Patrick O’Hara of Perth and joined the growing fleet of Couta Boats sailing in the West before returning to her home waters off Sorrento in 2000, where she will spend her ninetieth year afloat this coming season.